The genus Heterotheca is complex and not completely understood. In William Weber's words: "This group, centering around... Heterotheca villosa, exhibits an enormous range of variability. 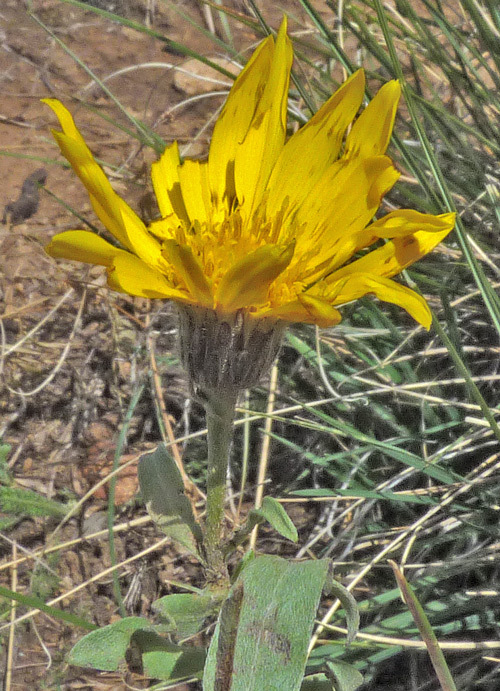 Many species and varieties have been proposed for what seem to be nodes of stability within a mass of variable characters...." In early editions of Colorado Flora: Western Slope, Weber listed four species of Heterotheca. In the latest edition (4th edition published in 2012) he lists only the two shown below: H. pumila and H. villosa. In addition, Weber recognizes three more species, H. canescens, H. foliosa, and H. latifolia on the Eastern slope. The Synthesis of the North American Flora and the Flora of North America recognize the following species of Heterotheca in the Four Corners area: H. fulcrata (uncommon in two counties), H. pumila, H. subaxillariis (rare in one county), H. villosa (with a number of subspecies), and H. zionensis, shown below. "Hetero" is Greek for "different" and "theca" for "case", referring to the differing seeds produced by the ray and disk flowers. This is an unusual characteristic, for many other Sunflowers produce identical seeds from both the outer ray flowers and the inner disk flowers. Heterotheca zionensis was named by John Semple, Heterotheca expert, from a collection he made near Zion National Park in the mid-1980s. The exact status of this plant is, however, by no means agreed upon. 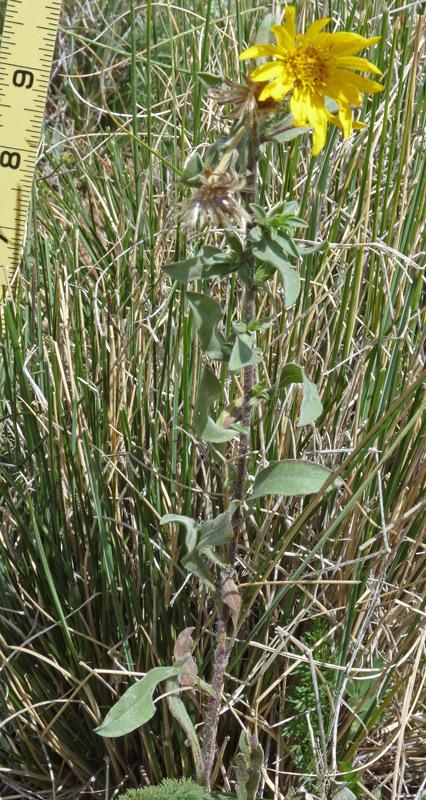 For instance, Stanley Welsh (Utah flora expert) indicates "Whether this [plant] can stand at specific level is open to question". He suggests that it might be one of the many varieties of villosa, but in his 4th edition of A Utah Flora, he does classify it as a species. typical H. villosa". But Nesom, too, as of 2013, gives Heterotheca zionensis, species status. In September of 2013 Nesom indicated to me that the plant shown below is H. zionensis. As mentioned above, H. zionensis is accepted at species level by the Flora of North America and the Synthesis. Foothills to montane. Shrublands, woodlands. Summer, fall. Robertson Pasture Trail, Abajo Mountains, Utah, September 6, 2013. Heterotheca zionensis is a perennial with one to many stems ranging from 4-24 inches tall. It can grow in clumps, or, as here as isolated plants. H. zionensis is a relatively new addition to the Heterotheca genus, having been collected, named, and described by John Semple just in the 1980s, although collections of it may have been made in the 1800s and misidentified as H. villosa. Semple indicates that Heterotheca zionensis "is the common species in much of Utah". 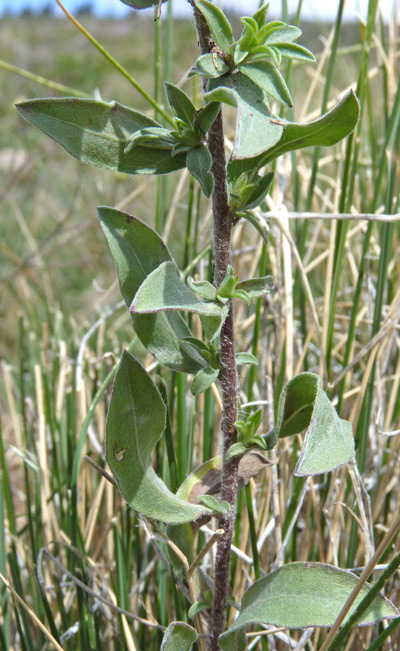 Stanley Welsh lists this species in A Utah Flora, but says, "Whether this can stand at specific level is open to question; it may constitute a recurrent morphology within the villosa complex of forms, and might be ultimately reduce to some taxonomic status within that complex". Red/brown seeds are topped by long plumes, the pappus hairs so characteristic of many Sunflowers. Some Asteraceae, such as the Heterothecas, have two layers of pappus, long and short. 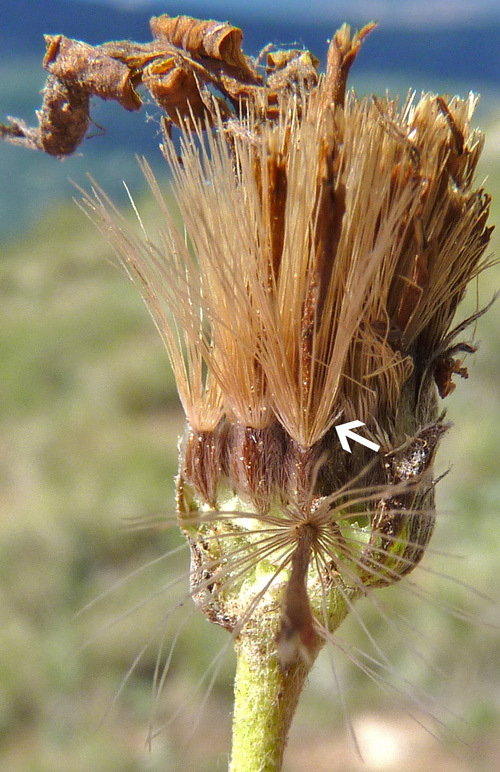 The arrow points to the short outer pappus hairs which surround the longer inner hairs. The shape, color, and hairiness of the seeds are also characteristic of the Heterotheca genus. The curled red/brown growths at the top left of the photograph are the dried outer ray flower petals. Leaves are covered in very fine, appressed (pressed flat or nearly flat) hairs. 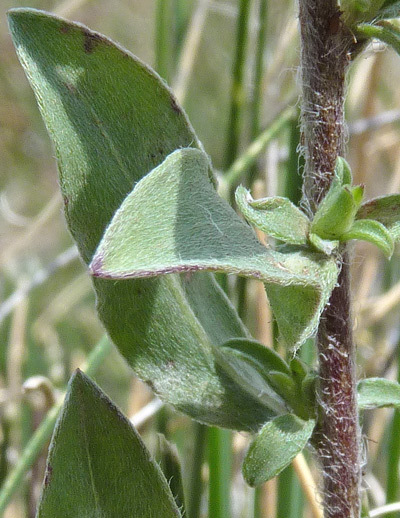 The upper leaves shown are nearly sessile whereas the lower leaves (not shown) have a long, tapering petiole (stem). The hairiness becomes quite apparent when photographs are blown up or when you take a closer look with a hand lens.